Digital signage is not the only application that is forcing AV contractors to start learning some tricks from the broadcast industry. As anyone who has ever specified a large-scale church installation will testify, the business of presenting, recording, and replaying multimedia events is becoming more like the world of television every day. The big difference is that while your local TV station is staffed by trained professionals, your local place of worship is trying to do a similar job with a team of well-intentioned but often inexperienced volunteers. So the challenge for contractors who supply systems to these volunteer broadcasters, and the manufacturers who design products for them, is to keep things simple and easy to operate without sacrificing quality or functionality. 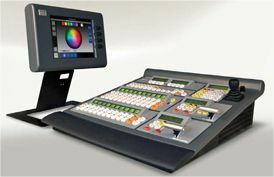 Nowhere in the technology chain is this more true than the seamless or production switcher, the box that enables end users to sequentially project different video sources onto their screens without having to worry about their varying formats, resolutions, or aspect ratios. Barco FSN Series likely to be in HD as SD, with the increasing affordability of HD-SDI video cameras—which are now a third of the price that they once were, according to Lamy—being a major driver here. But while a broadcast TV facility might have the luxury of deploying an all-HD workflow, most pro-AV facilities do not, and for good reason.